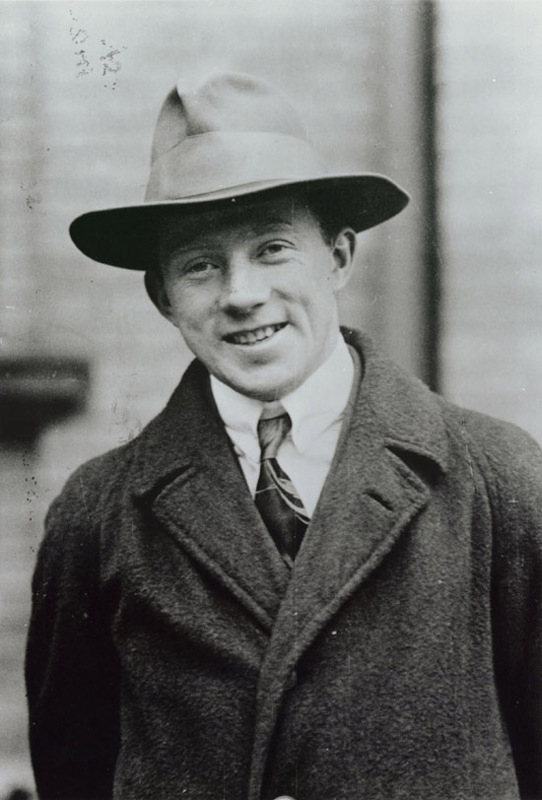 Use both versions of Heisenberg’s uncertainty principle in calculations. Explain the implications of Heisenberg’s uncertainty principle for measurements. Figure 1. The building up of the diffraction pattern of electrons scattered from a crystal surface. Each electron arrives at a definite location, which cannot be precisely predicted. The overall distribution shown at the bottom can be predicted as the diffraction of waves having the de Broglie wavelength of the electrons. Figure 2. 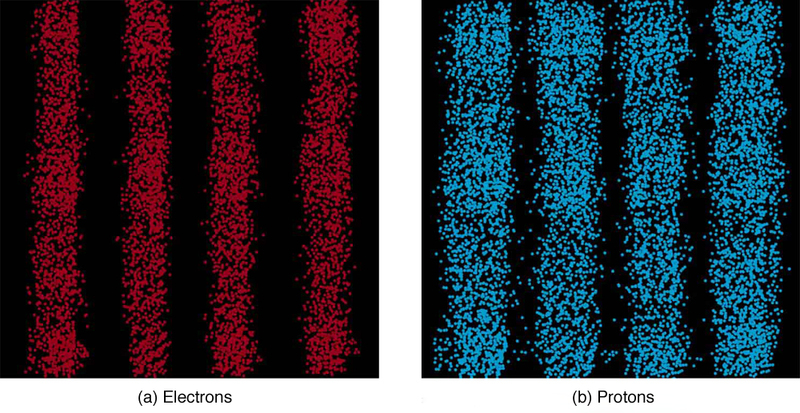 Double-slit interference for electrons (a) and protons (b) is identical for equal wavelengths and equal slit separations. Both patterns are probability distributions in the sense that they are built up by individual particles traversing the apparatus, the paths of which are not individually predictable. After de Broglie proposed the wave nature of matter, many physicists, including Schrödinger and Heisenberg, explored the consequences. 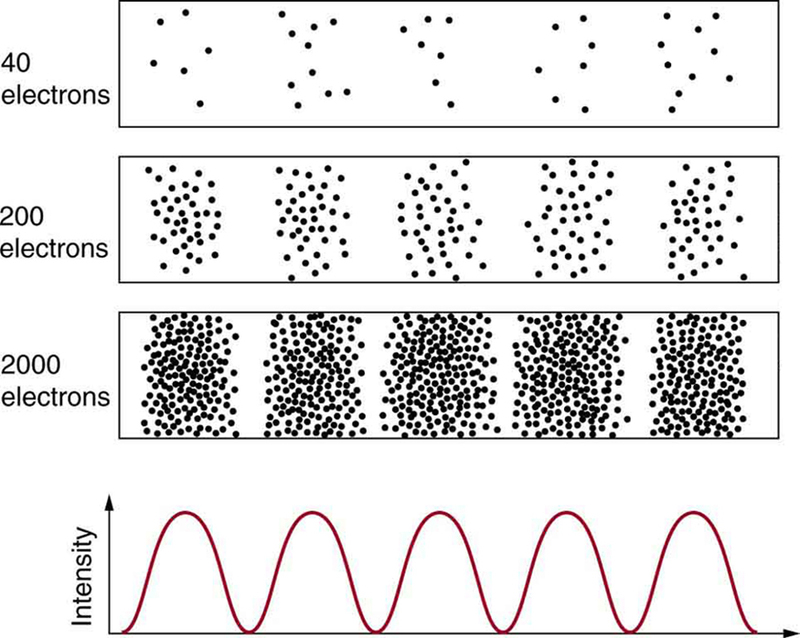 The idea quickly emerged that, because of its wave character, a particle’s trajectory and destination cannot be precisely predicted for each particle individually. However, each particle goes to a definite place (as illustrated in Figure 1). After compiling enough data, you get a distribution related to the particle’s wavelength and diffraction pattern. There is a certain probability of finding the particle at a given location, and the overall pattern is called a probability distribution. Those who developed quantum mechanics devised equations that predicted the probability distribution in various circumstances. It is somewhat disquieting to think that you cannot predict exactly where an individual particle will go, or even follow it to its destination. Let us explore what happens if we try to follow a particle. Consider the double-slit patterns obtained for electrons and photons in Figure 2. First, we note that these patterns are identical, following , the equation for double-slit constructive interference developed in Chapter 29.3 Photon Energies and the Electromagnetic Spectrum, where is the slit separation and is the electron or photon wavelength. Both patterns build up statistically as individual particles fall on the detector. This can be observed for photons or electrons—for now, let us concentrate on electrons. 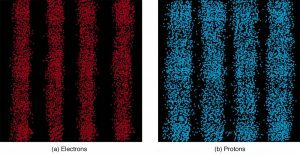 You might imagine that the electrons are interfering with one another as any waves do. To test this, you can lower the intensity until there is never more than one electron between the slits and the screen. The same interference pattern builds up! This implies that a particle’s probability distribution spans both slits, and the particles actually interfere with themselves. Does this also mean that the electron goes through both slits? An electron is a basic unit of matter that is not divisible. But it is a fair question, and so we should look to see if the electron traverses one slit or the other, or both. One possibility is to have coils around the slits that detect charges moving through them. What is observed is that an electron always goes through one slit or the other; it does not split to go through both. But there is a catch. If you determine that the electron went through one of the slits, you no longer get a double slit pattern—instead, you get single slit interference. There is no escape by using another method of determining which slit the electron went through. Knowing the particle went through one slit forces a single-slit pattern. If you do not observe which slit the electron goes through, you obtain a double-slit pattern. How does knowing which slit the electron passed through change the pattern? The answer is fundamentally important—measurement affects the system being observed. Information can be lost, and in some cases it is impossible to measure two physical quantities simultaneously to exact precision. For example, you can measure the position of a moving electron by scattering light or other electrons from it. Those probes have momentum themselves, and by scattering from the electron, they change its momentum in a manner that loses information. There is a limit to absolute knowledge, even in principle. So if one uncertainty is reduced, the other must increase so that their product is . This is known as the Heisenberg uncertainty principle. It is impossible to measure position and momentum simultaneously with uncertainties and that multiply to be less than . Neither uncertainty can be zero. Neither uncertainty can become small without the other becoming large. A small wavelength allows accurate position measurement, but it increases the momentum of the probe to the point that it further disturbs the momentum of a system being measured. For example, if an electron is scattered from an atom and has a wavelength small enough to detect the position of electrons in the atom, its momentum can knock the electrons from their orbits in a manner that loses information about their original motion. It is therefore impossible to follow an electron in its orbit around an atom. If you measure the electron’s position, you will find it in a definite location, but the atom will be disrupted. Repeated measurements on identical atoms will produce interesting probability distributions for electrons around the atom, but they will not produce motion information. The probability distributions are referred to as electron clouds or orbitals. The shapes of these orbitals are often shown in general chemistry texts and are discussed in Chapter 30.6 The Wave Nature of Matter Causes Quantization. (a) If the position of an electron in an atom is measured to an accuracy of 0.0100 nm, what is the electron’s uncertainty in velocity? (b) If the electron has this velocity, what is its kinetic energy in eV? The uncertainty in position is the accuracy of the measurement, or . Thus the smallest uncertainty in momentum can be calculated using . Once the uncertainty in momentum is found, the uncertainty in velocity can be found from . Since atoms are roughly 0.1 nm in size, knowing the position of an electron to 0.0100 nm localizes it reasonably well inside the atom. This would be like being able to see details one-tenth the size of the atom. But the consequent uncertainty in velocity is large. You certainly could not follow it very well if its velocity is so uncertain. To get a further idea of how large the uncertainty in velocity is, we assumed the velocity of the electron was equal to its uncertainty and found this gave a kinetic energy of 95.5 eV. This is significantly greater than the typical energy difference between levels in atoms (see Chapter 29.3 Table 1), so that it is impossible to get a meaningful energy for the electron if we know its position even moderately well. Why don’t we notice Heisenberg’s uncertainty principle in everyday life? The answer is that Planck’s constant is very small. Thus the lower limit in the uncertainty of measuring the position and momentum of large objects is negligible. We can detect sunlight reflected from Jupiter and follow the planet in its orbit around the Sun. The reflected sunlight alters the momentum of Jupiter and creates an uncertainty in its momentum, but this is totally negligible compared with Jupiter’s huge momentum. The correspondence principle tells us that the predictions of quantum mechanics become indistinguishable from classical physics for large objects, which is the case here. where is the uncertainty in energy and is the uncertainty in time. This means that within a time interval , it is not possible to measure energy precisely—there will be an uncertainty in the measurement. In order to measure energy more precisely (to make smaller), we must increase . This time interval may be the amount of time we take to make the measurement, or it could be the amount of time a particular state exists, as in the next Example 2. An atom in an excited state temporarily stores energy. If the lifetime of this excited state is measured to be , what is the minimum uncertainty in the energy of the state in eV? The minimum uncertainty in energy is found by using the equals sign in and corresponds to a reasonable choice for the uncertainty in time. The largest the uncertainty in time can be is the full lifetime of the excited state, or . The lifetime of is typical of excited states in atoms—on human time scales, they quickly emit their stored energy. An uncertainty in energy of only a few millionths of an eV results. This uncertainty is small compared with typical excitation energies in atoms, which are on the order of 1 eV. So here the uncertainty principle limits the accuracy with which we can measure the lifetime and energy of such states, but not very significantly. The uncertainty principle for energy and time can be of great significance if the lifetime of a system is very short. Then is very small, and is consequently very large. Some nuclei and exotic particles have extremely short lifetimes (as small as ), causing uncertainties in energy as great as many GeV ( ). Stored energy appears as increased rest mass, and so this means that there is significant uncertainty in the rest mass of short-lived particles. When measured repeatedly, a spread of masses or decay energies are obtained. The spread is . You might ask whether this uncertainty in energy could be avoided by not measuring the lifetime. The answer is no. Nature knows the lifetime, and so its brevity affects the energy of the particle. This is so well established experimentally that the uncertainty in decay energy is used to calculate the lifetime of short-lived states. Some nuclei and particles are so short-lived that it is difficult to measure their lifetime. But if their decay energy can be measured, its spread is , and this is used in the uncertainty principle ( ) to calculate the lifetime . There is another consequence of the uncertainty principle for energy and time. If energy is uncertain by , then conservation of energy can be violated by for a time . Neither the physicist nor nature can tell that conservation of energy has been violated, if the violation is temporary and smaller than the uncertainty in energy. While this sounds innocuous enough, we shall see in later chapters that it allows the temporary creation of matter from nothing and has implications for how nature transmits forces over very small distances. Finally, note that in the discussion of particles and waves, we have stated that individual measurements produce precise or particle-like results. A definite position is determined each time we observe an electron, for example. But repeated measurements produce a spread in values consistent with wave characteristics. The great theoretical physicist Richard Feynman (1918–1988) commented, “What there are, are particles.” When you observe enough of them, they distribute themselves as you would expect for a wave phenomenon. However, what there are as they travel we cannot tell because, when we do try to measure, we affect the traveling. Matter is found to have the same interference characteristics as any other wave. There is now a probability distribution for the location of a particle rather than a definite position. 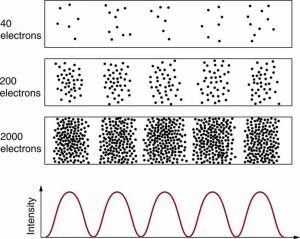 Another consequence of the wave character of all particles is the Heisenberg uncertainty principle, which limits the precision with which certain physical quantities can be known simultaneously. For position and momentum, the uncertainty principle is , where is the uncertainty in position and is the uncertainty in momentum. For energy and time, the uncertainty principle is where is the uncertainty in energy and is the uncertainty in time. These small limits are fundamentally important on the quantum-mechanical scale. 1: What is the Heisenberg uncertainty principle? Does it place limits on what can be known? 1: (a) If the position of an electron in a membrane is measured to an accuracy of , what is the electron’s minimum uncertainty in velocity? (b) If the electron has this velocity, what is its kinetic energy in eV? (c) What are the implications of this energy, comparing it to typical molecular binding energies? 2: (a) If the position of a chlorine ion in a membrane is measured to an accuracy of , what is its minimum uncertainty in velocity, given its mass is ? (b) If the ion has this velocity, what is its kinetic energy in eV, and how does this compare with typical molecular binding energies? 3: Suppose the velocity of an electron in an atom is known to an accuracy of (reasonably accurate compared with orbital velocities). What is the electron’s minimum uncertainty in position, and how does this compare with the approximate 0.1-nm size of the atom? 4: The velocity of a proton in an accelerator is known to an accuracy of 0.250% of the speed of light. (This could be small compared with its velocity.) What is the smallest possible uncertainty in its position? 5: A relatively long-lived excited state of an atom has a lifetime of 3.00 ms. What is the minimum uncertainty in its energy? 6: (a) The lifetime of a highly unstable nucleus is . What is the smallest uncertainty in its decay energy? (b) Compare this with the rest energy of an electron. 7: The decay energy of a short-lived particle has an uncertainty of 1.0 MeV due to its short lifetime. What is the smallest lifetime it can have? 8: The decay energy of a short-lived nuclear excited state has an uncertainty of 2.0 eV due to its short lifetime. What is the smallest lifetime it can have? 9: What is the approximate uncertainty in the mass of a muon, as determined from its decay lifetime? 10: Derive the approximate form of Heisenberg’s uncertainty principle for energy and time, , using the following arguments: Since the position of a particle is uncertain by , where is the wavelength of the photon used to examine it, there is an uncertainty in the time the photon takes to traverse . Furthermore, the photon has an energy related to its wavelength, and it can transfer some or all of this energy to the object being examined. Thus the uncertainty in the energy of the object is also related to . Find and ; then multiply them to give the approximate uncertainty principle. (c) From Chapter 29.3 Table 1, we see that typical molecular binding energies range from about 1eV to 10 eV, therefore the result in part (b) is approximately 9 orders of magnitude smaller than typical molecular binding energies. 29.7 Probability: The Heisenberg Uncertainty Principle by OpenStax is licensed under a Creative Commons Attribution 4.0 International License, except where otherwise noted.